Four spectacular events to celebrate the seasons. These special events will be filled with the best chefs, farmers and food around and will occur once a season (spring, summer, winter and fall) to highlight the delights of each season. 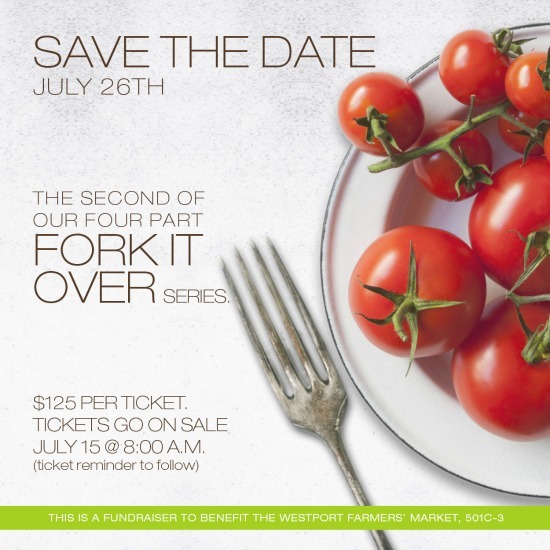 What more could a locavore ask for?Tickets for the next event can be purchased on July 15th here. The locations for the next event are top secret but CTbites has the line-up of chefs for the July 26th event...and they are good! Matt Storch, James Cooper, Geoff Lazlo and Arik Bensimon and a few special guests that will be left to surprise and delight. WFM will tell you when, but not where (at least, not until the day before). You pick the date, and WFM will deliver one of the best, most intimate, knock-your-socks-off locally sourced meals you’ve ever had. Will it be a clam bake? A wood-fired dinner? Or maybe pig roast? There’s no telling. Tickets will go on sale on a rolling basis, as the events unfold: Spring event is on May 31 with tickets going on sale May 13, Summer event is July 26, Fall is Sept 27 and Winter March 3. These events are intimate affairs and space will sell out quickly. So save your date, wait for the email from the Farmers Market, and then don’t wait to purchase your tickets. More details aren’t available now, but when they are, you can find them at www.westportfarmersmarket.com or by emailing director@westportfarmersmarket.com.